(Photo Credit: Eoin Mundow/SEEN Sport Magazine) WBO light heavyweight champion Nathan Cleverly (26-1, 12 KO’s) was BADLY exposed tonight by the unbeaten powerful Russian Sergey Kovalev (22-0-1, 20 KO’s) in what you can only call a total slaughter in losing to Kovalev by a 4th round TKO at the Motorpoint Arena, Cardiff, Wales, United Kingdom. Heck, it wasn’t even a fight. It was like watching someone pound away at a helpless punching bag. I mean, Cleverly hit the deck three times in the fight, and the fight should have been stopped in the 3rd round after Cleverly had been knocked to the canvas twice by crushing right hands from Kovalev. In the 4th, Kovalev put Cleverly out of his misery by nailing him with 5 right hands to the head that dropped him for the 3rd and final time in the fight. The referee didn’t even think about letting the slaughter continue, and he did the wise thing by putting a stop to it. Cleverly came out for the 1st round looking like he wanted no part of Kovalev. The only thing that Cleverly could muster up were a few half-hearted jabs that seemed to be thrown more as way of keeping Kovalev off of him than as a real weapon. Kovalev just teed on Cleverly in the opening round, nailing him with big right hands and left hooks to the head. It looked like Cleverly thought for a second of mixing it up with Kovalev, but once he tasted some of the Russian’s power, he wanted no part of him at all, period. I’d never seen Cleverly fight so timidly before, but then again up until this fight, Cleverly really hadn’t ever fought anyone that you could call a really good fighter. Before this fight, Cleverly beating guys like Tommy Karpency, Tony Bellew [barely], Robin Krasniqi, Shawn Hawk, and Aleksy Kuziemski. There was just no real quality opposition at all on Cleverly’s resume before this fight, so it really wasn’t that surprising to see Kovalev slice through Cleverly like a hot knife through butter. When you get a guy like Cleverly with an inflated record built on less than impressive opposition this is what happens. You get him blown out in the worst way. It’s hard to say where Cleverly can go from here. I suppose he can go after the light heavyweight European strap or maybe the British light heavyweight belt. 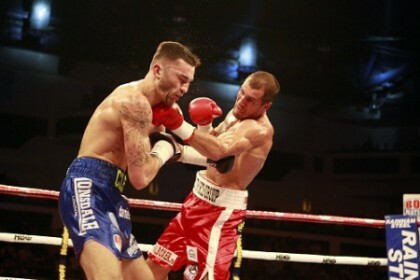 I wouldn’t put Cleverly in with a puncher after this fight for a long, long time. I didn’t like the way he was eating canvas when he would take right hands to the head. It looked awful.